A Midnight Rider: Another Gift Book. All of the bicycle books have been read and it's time to move on to other subjects. The only sport I watch is football or as us yanks say, soccah. One of the boys got me this book as a Christmas gift and it's a page turning eye opener. 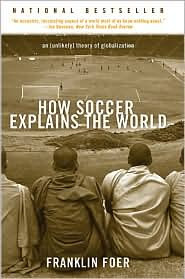 This may replace my favorite soccer book "Fever Pitch" I'm not far into it, and it's really got my attention. Franklin Foer travels the world from Brazil to the Ukraine with plenty of stops in between probing and observing. The stories he tells demonstrate how trends in soccer are a reflection of globalization. The book shows the effects of globalization at a cultural and national level as well as its effect on the lives of individuals. The individual stories are the glue that holds the overall narrative together. First, I'll read Hornby's book. I've wanted to for a while. Thanks for the book tips.